Research areas that are being pursued actively in the laboratory are broadly described under two categories of (A) Systems Biology, (B) Structural Bioinformatics, both intersecting with fundamental issues of Drug Discovery. Systems level modeling and simulation studies have been carried out with tuberculosis as the disease focus. Systems biology itself is a newly emerging area and the work carried out in the department is providing an integrative platform to link sequence, structure and systems levels. Towards this goal, development of new algorithms and methodologies for structural data mining and analysis are also being explored. Work in the past few years has led to reconstruction of major part of metabolism in Mycobacterium tuberculosis, and simulations using stoichiometric methods, which has provided reaction flux profiles. Together with sequence and structural bioinformatics tools, the systems models have been utilized to identify high confidence drug targets for tuberculosis through a new pipeline termed as targetTB. A genome-scale protein-protein interaction network has also been reconstructed, which has enabled a novel formulation of the problem of drug resistance, allowing us to identify possible routes through which drug resistance could emerge in bacteria. The models and methodologies established enable addressing several new questions to understand key aspects of M.tuberculosis and application of that knowledge in drug discovery. A comprehensive target identification study by integrating reactome, interactome analyses, sequence and novel structure based druggability analyses that has resulted in the identification of about 451 high confidence drug targets. A novel druggability assessment step is included in this. For the identified targets, Lead identification through structural analysis, molecular modeling, ligand docking and virtual screening, ab-initio design guided by interaction fingerprinting is also carried out. 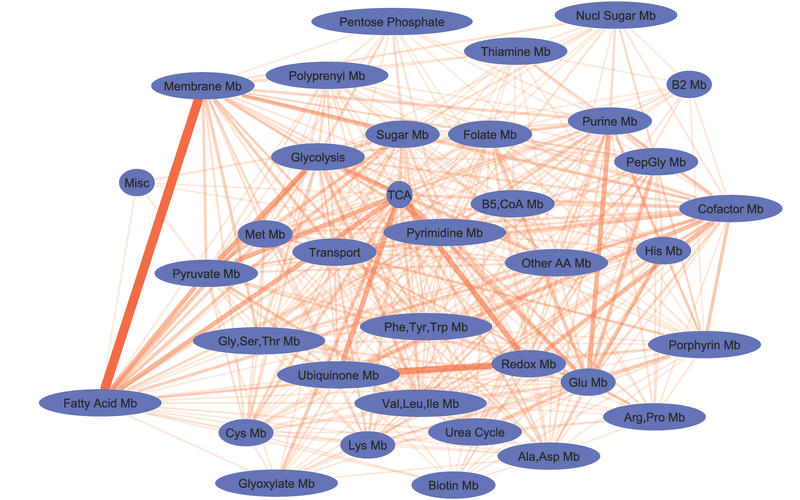 A genome-scale protein-protein interaction network in Mtb is reconstructed, which has enabled a novel formulation of the problem of drug resistance, allowing us to identify possible routes through which drug resistance could emerge in bacteria. This is a first study of its kind in the literature and the analysis provides several testable hypotheses. 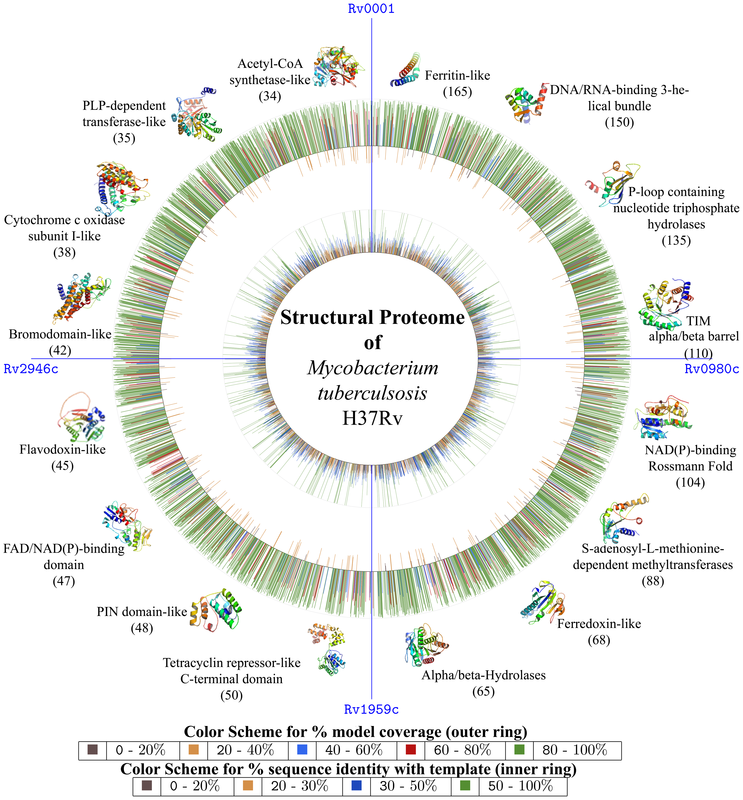 Structure based function annotation has been obtained at a genome scale for mycobacterial proteins, using novel methods based on binding site identification and subsequent ligand association, in many steps, for which algorithms developed in-house (eg.PocketDepth, PocketMatch) are used. The annotation provides a first opportunity to obtain a global perspective of various aspects such as the fold distribution in this genome, structural domains that co-occur in a polypeptide chain and most frequently occurring structural motifs. Schematic view of structural annotation of proteins coded by the M.tuberculosis genome Specific objectives that are currently being pursued are: rational identification of combination targets and combination drug leads for tuberculosis using genome-scale networks and structure-based methods, exploring the use of co-targets to check emergence of drug resistance using a combination of systems and structural level studies, pharmacodynamic modeling and understanding drug failure, metabolic reprogramming in M.tuberculosis upon drug treatment by integrating experimental and computational approaches and systems biology of host-pathogen interactions. 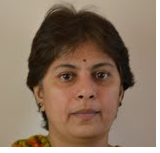 Baloni P, Chandra N. Architectural plan of transcriptional regulation in Mycobacterium tuberculosis. Trends Microbiol. 2015 Mar;23(3):123-5. doi: 10.1016/j.tim.2015.02.002. Epub 2015 Feb 17. Mukherjee S, Chandra N. Grouping of large populations into few CTL immune 'response-types' from influenza H1N1 genome analysis. Clin Transl Immunology. 2014 Aug;3(8):e24. doi: 10.1038/cti.2014.17. Anand P, Chandra N. Characterizing the pocketome of Mycobacterium tuberculosis and application in rationalizing polypharmacological" target selection. Sci Rep. 2014 Sep 15;4:6356. doi: 10.1038/srep06356. 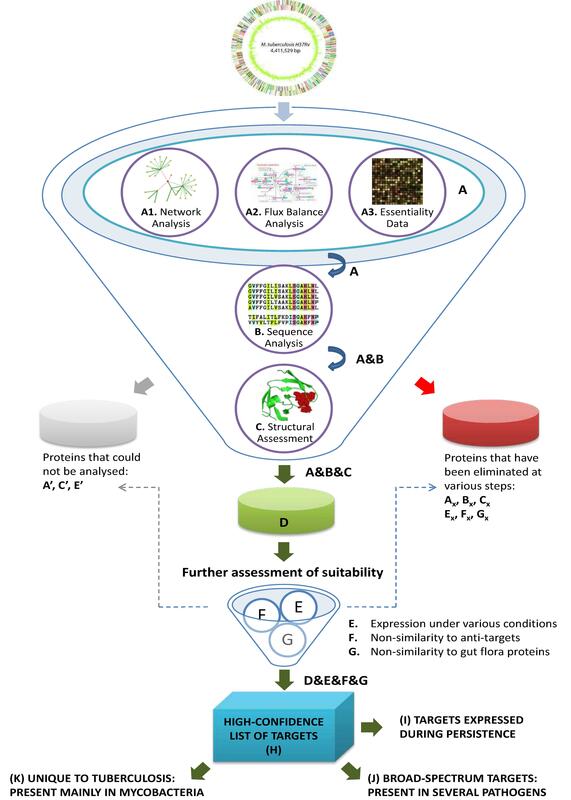 Sambarey A, Prashanthi K, Chandra N. Mining large-scale response networks reveals 'topmost activities' in Mycobacterium tuberculosis infection. Sci Rep. 2013;3:2302. doi: 10.1038/srep02302. Ghosh S, Prasad KV, Vishveshwara S, Chandra N. Rule-based modelling of iron homeostasis in tuberculosis. Mol Biosyst. 2011 Oct;7(10):2750-68.